This artist’s illustration depicts NASA’s AIM satellite in Earth orbit, where it will scan the planet’s noctilucent – or ‘night shining’ – clouds. Apiano-sized NASA satellite is poised to launch spaceward Wednesday afternoon ona mission that, astronomers hope, will reveal the unsolved mysteries of Earth'shighest clouds. The OrbitalSciences-built Aeronomyof Ice in the Mesosphere (AIM) spacecraft is poised to rocket spaceward ona two-year mission to scan noctilucent,or 'night-shining,' clouds that can only observed after sunset. Anair-launched Pegasus XL booster is due to loft the AIM probe at 4:23 p.m. EDT(2023 GMT) in a space shot to begin at California's Vandenberg Air Force Base. "We are exploringclouds that literally are at the very edge of space," James Russell, AIM'sprincipal investigator at Hampton University in Hampton, Virginia, said in aprelaunch mission briefing. Also knownas Polar Mesospheric Clouds (PMCs), noctilucent clouds are made up of icecrystals and hover some 50 miles (80 kilometers) above the surface of theEarth. The cloudy phenomena tend to be seen above the Earth's polar regions andhave been observed from the ground and space, though not at the levels ofdetail expected from AIM, researchers said. "Thismission is the first mission dedicated to the study of noctilucent clouds,"Russell said. "We have observed them with satellites [in the past], and allit's done is left us wanting." Researchersfirst observed noctilucent clouds in 1885 following the eruption of theKrakatoa volcano, though the exact nature of their genesis remains a mystery.Added to the pot is the clouds' odd increase in frequency in recent years,sometimes in regions previously void of such displays, prompting someresearchers to link their formation to worldwide climate changes such as globalwarming. "It's anatural question to ask 'Why are we seeing them now when we haven't before,'"Russell said. Noctilucentclouds tend to occur between about May 15 to Aug. 20, with a peak inactivity about 20 days after the summer solstice on June 21, AIM researcherssaid. During their two-year mission, AIM's instruments are expected to scanfour noctilucent cloud seasons -- two in the Northern Hemisphere and the otherin the Southern Hemisphere -- and will hopefully shed some let on the clouds'variety. "They'rebrighter in the north than in the south, for example," Russell said. Similarclouds have been observed high above the surface of Mars, leading researchersto believe that a better understanding of the phenomena will aid futuremissions to the red planet by yielding fundamental knowledge on the interactionof the Sun's energy and planetary atmospheres. "Theseclouds are indicators of conditions in the upper reaches of the Earth'satmosphere, and are an important link in the chain of processes that result inthe deposition of solar energy into Earth's atmosphere," Mary Mellott, AIMprogram scientist, NASA's Washington D.C. headquarters, said in a statement. "AIMwill provide an understanding of how and why these clouds form, an importantcontribution toward the NASA goals of understanding the fundamental physicalprocesses of our space environment and how the habitability of planets isaffected by the interaction of planetary magnetic fields and atmospheres withsolar variability." The Cloud Imaging and Particle Size (CIPS) is laden with four cameras, each positioned at a different angle, to return two-dimensional images at noctilucent clouds that are expected to yield sizes for the ice particles in each formation and generate a daily panorama of the polar ice cap. The Solar Occultation for Ice Experiment (SOFIE) is designed to measure the particles, temperatures atmospheric gases that make up each cloud to reveal their chemical composition and formation environment. The Cosmic Dust Experiment is designed to record the amount of interstellar dust that enters the Earth's atmosphere so researchers can study its role in noctilucent cloud formation. Together, theinstruments are designed to tackle six primary target areas that includelong-term changes in the Earth's upper atmosphere, temperature variations,hydrogen chemistry, and the influence of gravity waves on cloud formation. Theywill scan clouds in the Earth's mesosphere, a region of the atmosphere thatsits above the stratosphere. Thespacecraft relieson six solar panels, wrapped around the probe at launch, to generate the216 watts of power required to support its science instruments. "The wholedeployment sequence takes about 20 minutes," said Chris Savinell, NASA's AIMmission manager at the agency's Goddard Space Flight Center in Greenbelt, Maryland, in a preflight briefing. 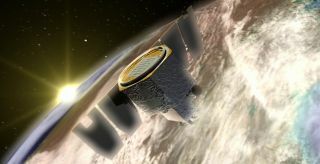 AIM is oneof NASA's Small Explorer missions designed to develop relatively low-cost spacescience and exploration expeditions. "ThisSmall Explorer mission is a good example of the huge science returns we can getfor a relatively small cost investment," said Vicki Elsbernd, NASA's AIMprogram executive, in a statement. NASA will broadcast the AIM mission launch live via NASA TVbeginning at 3:00 p.m. EDT (1900 GMT).